You are currently browsing the tag archive for the ‘council’ tag. Glitch Video Screening will feature works by Gratuitous Art Films, Anna Pinkas and Kennedy James. Following the screening is a performance by R.G.B.A. This event will be held from 6:30-8:30pm during the Dumbo 1st Thursday Gallery Walk in conjunction with the group exhibition Glitch Generation, now on-view in BAC Gallery. Glitch is an experiment in mistakes. It is charming speedboat ride down the rabbit hole created by manipulating and looping archival footage with audio created by Andy LaChance and Jeff Burns. It is a piecemeal composite that relies on it’s inconsistencies. Utilizing the giving nature of archival footage already littered with “glitches” we chose to enhance, distort or create our own foibles at will. Also, we think dental health is an important. Thistle is the story of a walk in the forest. A young boy’s journey and discovery of something forbidden. The roil of emotions as he battles with the nature of what he has seen. The wonderment, the fear, the growth…the armadillo. One wonders, can you come back again once you have seen the vulture? The Fortune Cookie is a video work about cinematic narration, the superposition of the American and French soundtracks of the original film. R.G.B.A. will feature the project “Synchroma”, a video and sound instrument developed by DRAW. The project Synchroma derives imagery entirely from sound, via analog-digital conversion hardware/software whereby each color channel is driven by a separate audio stream: red, green and blue. Extremes of frequency are used, varying from 0.013 to 43,000 Hz, to produce variations in palette, tempo, shape, direction and pattern. Once harvested, the synthesized color fields become the basis for improvisations set to multiple vibrant scores. Among this array of hardware/software, a core device is the ‘Synchronator’ developed by Gert-Jan Prins and Bas van Koolwijk during a video and audio research residency at Impakt 2006, currently distributed by the Netherlands Media Art Institute. Gratuitous Art Films is a collaborative effort between artists Jeff Burns and Cat Gilbert. Jeff is the editor, co-founder and contributor for “When History Attacks” and Talkie 21 Studios. Cat is multi-media artist who makes books, drawings and otherwise. Kennedy James, previously working under the name of Jimmy Owenns lives and works between New York City and Paris, France. Since 1998, James’ work has taken a clear direction towards notions about the splitting of the perception, narration or psyche and the search for identity. Anna Pinkas was born in 1985 in Geneva, Switzerland. Working primarily in animation and drawing, Anna investigates narratives-personal and historical, uncovering and conjuring up our constant search for linear, comprehensive and resolved stories. While she was raised in a family with a long migration history, her own departure from Europe to the United States was integral in triggering the set of inquiries that form the core of her art practice today. Pinkas currently lives and works in Brooklyn, New York. R.G.B.A. is a live video audio performance collaboration between duo DRAW (Nisi Jacobs and Michael Schumacher)and Sarah Bernstein and Stuart Popejoy. DRAW’s compositions form the basis for improvisations involving processed video, algorithmically generated sound and live musicians. Through experimentation and dialogue, they explore in depth the relation between sound and image. Their practice involves a number of strategies, such as coupling specific sound and image sequences, using multi-channel setups for video + sound, role-switching, and exploring notational techniques. Sarah Bernstein and Stuart Popejoy create sonic work exploring liminal spaces: between pitch and timbre, speech and music, development and repetition, lucidity and opacity. Bernstein combines acoustic violin performance with live-processed spoken word and vocalization; Popejoy uses the Nord Modular G2 synthesizer to create generative compositions and complex sound processing environments; finally, the violin and voice signals are selectively further processed live in the Nord synthesizer. Compositional elements – motives, texts, strategies, patches – are integrated with live improvisation through the techniques of feedback, generational development, [de]emphasis of textual signification, and interplay of “pure” musical elements with non- and extra-musical elements. Gallery participates in DUMBO 1st Thursday. Come down the first Thursday of every month for special programming and extended gallery hours! GLITCH GENERATION OPENING, THURSDAY FEB 4th. 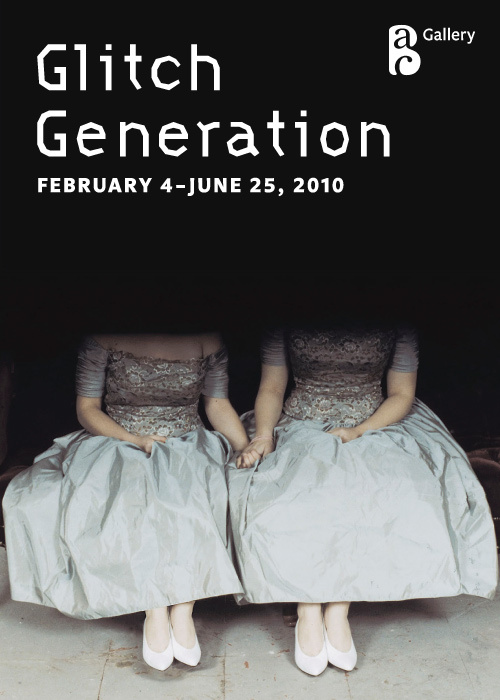 GLITCH GENERATION OPENS FEB 4th. Show opens the 4th and you can check out our video at the screening on May 6th. More gratuitous updates and reminders to come.